On Sunday, October 17, 1999, the winner of the Gateway Central VI (GCVI) was selected at the Division’s Fall Train Show. The lucky winner was Father Edward Doyle from Montgomery City, Mo. He was out of town when we called to notify him, but returned our call a few days later to arrange to pick up GCVI. Father Doyle is a model railroader with a moderate HO layout, and some N scale and some G scale as well. He is delighted with the layout and is already looking at it with an eye to incorporating it into his existing layout. However, before that will happen, GCVI will be displayed at one more train show. Father Doyle is a member of the Train Collectors Association and is planning to have the layout on display at their show in Columbia, Mo on November 6! It’s nice to know that GCVI has found a good home and that it continues to travel the country for others to see. The design of GCVI really began at the NMRA National Convention in Kansas City in July 1998. I found myself as chair of the project after pointing out a Model Railroader project railroad in the December 1997 issue. After some discussion with Richard Schumacher and Randy Meyer who volunteered to co-chair with me, we decided it would be interesting to build the layout using one of the new sectional track systems, especially if one of the manufacturers would be willing to donate the track needed. John Lee told us that he believed Life-Like would be glad to contribute their Power-Loc track. With that information we approached Life-Like in Kansas City and they volunteered the track, a locomotive and quite a bit more. We also approached Walthers for their sawmill, paper mill and kraft mill, and they too were generous. 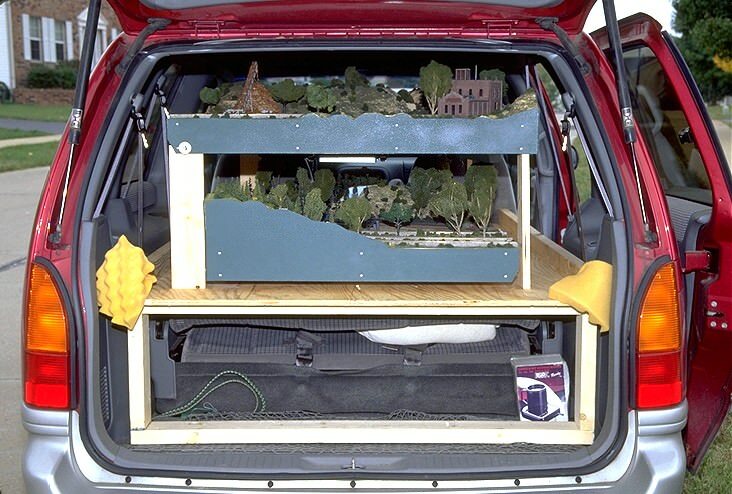 By the time we finished our rounds with the manufacturers in Kansas City, we had donations that covered power pack and sound system, locomotive rolling stock, structures, and scenery materials. As a result, GCVI cost the Division less to build than any preceding project layout and it has contributed significantly to the Division’s treasury. This was partially because of the many donations we received but it still would not have been possible had it not been for the many, many Gateway Division members who worked to construct the layout, built the structures, and especially put in hours selling tickets whenever GCVI was on display. My thanks go to everyone who contributed to this layout. Without your help and work it would not have been the success it was. 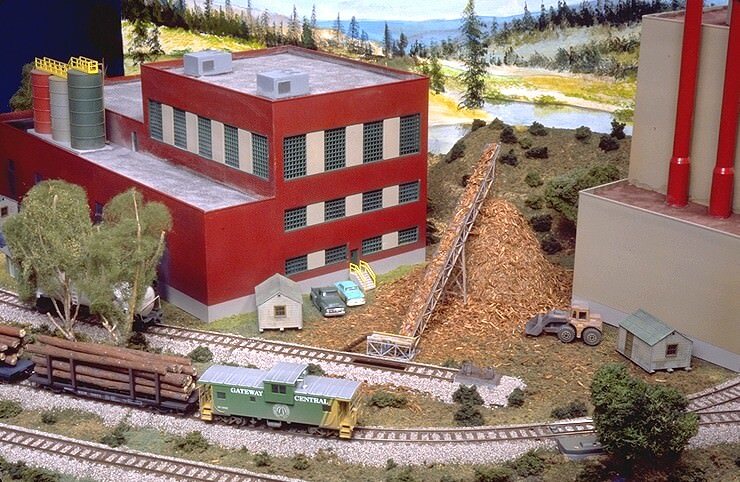 Gateway Central VI was designed around two logging industry scenes (one on each side of the layout). The above photos show the paper and kraft mills with a chip unloading area (real sawdust!) and the sawmill and mill pond scene with a cut lumber loading area. This overhead view shows the track plan. 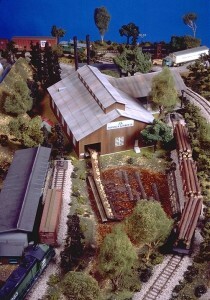 The paper mill has been removed to show the track which ran inside the mill building. The “white line” down the middle is the position of the extruded styrofoam removable scenic divider/background. 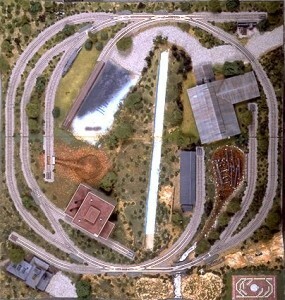 Life-Like Power-Loc track was used. A unique feature of this layout is that it is designed to be transported in normal-size mini-vans and SUVs. The layout divides into two unequal sized sections, designed to stack one on top of the other.